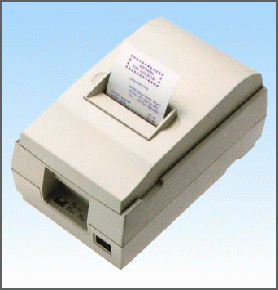 The TM-U200 is an ideal low cost printer for point-of-sale applications. The modular user-friendly design, graphics capability, and 3.5 lines per second print speed offer reliable high performance in a compact, lightweight design. The TM-U200 features modular interface boards that enable users to select from bi-directional parallel, RS-232C, RS-422, RS-485, Ethernet and USB interfaces simply by ordering a new module. Other features include a paper end detector that automatically alerts the user when the printer is out of paper, an auto cutter and take up, and the ability to print one original plus two copies. Now available in Epson Dark Gray (EDG).